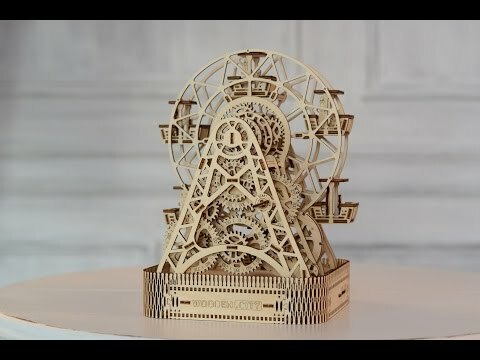 The Wooden.City 3D puzzle Ferris Wheel is an original interpretation of our favourite amusement park attraction and a tribute to the engineers who realized our dreams to see the world from a bird’s eye view. This is a project of advanced level of difficulty. All you need to assemble this sophisticated model with a rubber band engine is included in the box: detailed step-by-step instructions and a set of high quality plywood boards with precisely pre-cutout parts and other details. The explanations of assembly stages are intuitive and easy to follow. The only tools required are your own hands, time and some patience. The Ferris Wheel model can boast of nice bonus features – a secret casket and a small coin box.